I always had a thing for eyes. Cat eyes always fascinated me. I always wondered what the cats were thinking. Dog eyes were the best of all. My first dog, Tango, had dancing eyes. My Doberman, Ariel, possessed the saddest eyes I had ever seen. 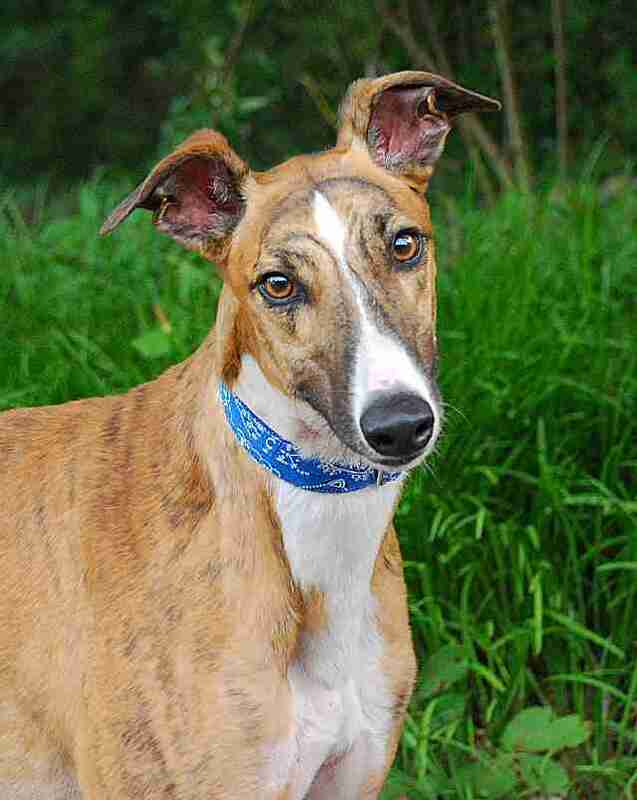 Then the first pair of greyhound eyes came along. Sultan had big “Bambi” eyes and classic greyhound eyeliner. His eyes said, “Love me.” Those eyes communicated better than any spoken words over the years. Here I am, an owner of sight hounds. I got to thinking: what makes sight hounds sight hounds? They are hounds that hunt by sight. That means their gorgeous eyes are pretty important. The eye is an organ with several parts. The inner eye has two chambers. The anterior chamber is between the cornea and the lens. The posterior contains a clear jelly and is the larger central cavity of the eye between the lens and the retina. Light enters the eye by passing first through the cornea and anterior chamber and then through the pupil and the lens. The iris expands and contracts, depending upon the brightness of the light. Light then traverses the posterior chamber and the retina receives it. The light converts into nerve impulses that pass via the optic nerve to the brain. The eye’s anatomy is similar in mammals. However, its functional capabilities vary greatly among the species. A dog’s eyes are towards the front of its head and are unable to see behind it. This is true of most predatory species. Prey species such as deer and antelopes have their eyes fixed on the sides of their heads. 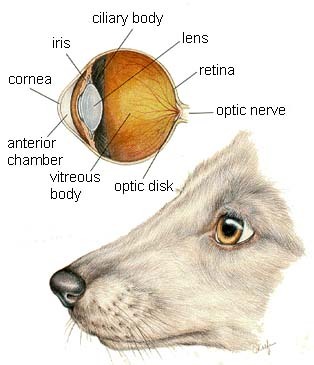 In some breeds, such as the sighthound breeds, the total field of vision is 270 degrees. This is 70 degrees greater than that of humans whose visual field is about 180 degrees. The average dog has a visual field of about 250 degrees. Flat faced breeds such as pugs have a little less. Therefore, sighthounds with their narrow heads can detect small movements over a much greater slice of landscape. If we are out walking and a cat is running some distance away, sighthounds will react and notice it much more quickly than a person would. We can be walking on the road and see a squirrel sitting quietly — almost frozen, if you will. Yet, the dogs are completely oblivious to that. Although sighthounds have the ability to detect movement at great distances, their binocular vision is only about 70 degrees. Flat-faced breeds such as the pug or boxer have a binocular field of about 80 degrees. In humans the binocular field is 140 degrees; therefore humans have an advantage in depth perception. Both humans and dogs have binocular vision: we see the landscape through both eyes. When looking straight ahead, the images found by the eyes overlap to some extent. Because of the distance between the right and left eye, they will record slightly different images, which allows the brain to estimate distance shape, and texture. The greater this overlap, the greater is the capability for depth perception to evaluate and recognize objects. Without it, the landscape would look almost flat. The canine eye is smaller than the human eye although the cells in both retinas are of equal size. The image formed on the dog’s retina is only about 75 percent of the image in the human eye. This covers a smaller number of cells; we lose detail but gain sharpness and depth perception. Human eyes and dog eyes work differently in the dark. One night someone had forgotten to put on the hallway light. When I arrived home with the dogs I had a lot of difficulty finding the keyhole. I finally got the key in the lock. I was at the bottom of the stairs with Feather and Tauren. Here I am with my arms full. I can barely see in the dark and I knew the dogs had to get up the stairs. So I just let them lead the way and, sure enough, they got me safely to the top of the darkened stairs. These animals can see and navigate quite well in the dark.They have a significantly higher rod and cone ratio than we humans. They are two different types of cells that exist in the retina of the eye. The name comes from their shape. Rods will record shapes and general outlines even in very low light levels. Cones register fine detail in bright light. Rods in the eye are sensitive to light and are useful for black and white vision. Dogs also have a light reflecting layer called the tapetum lucidum at the back of their eyes, which acts as an image-intensifying device allowing them to utilize what little bit of illumination is available. Dog eyes that are in the process of adapting to seeing in dim light go through a few modifications. Finger-like projections of the tapetum move forward. They line the inner surface of the choroid to form a reflective layer behind the retina. The light passes through the retina in the dark-adapted eye, instead of being absorbed. The choroid reflects straight back through the retina by the tapetum twice and has a greater chance of activating the light sensitive rods. In the dog, the tapetum is usually green or yellowish green. Hence the weird dog eyes that greet you when you are shining a flashlight in the middle of a power outage. Cats have this same advantage. Wild dogs tend to become active at dusk. That is the reason why nature allowed this adaptation to occur. Human vision has a higher cone and rod ratio and accounts for us having better color vision than dogs do. The evidence does point to the fact that dogs do perceive some colors. Perhaps they look at the world with rose colored spectacles. This may not be a bad way to live, eh? Dog Owner’s Home Veterinary Handbook, Delbert G. Carlson D.V.M and James M. Giffen M.D.,Howell Book House, New York, 1992. DogWatching, Desmond Morris, Three Rivers Press, New York, 1986. Dog Behaviour, Dr. Ian Dunbar, TFH Publications, New Jersey, 1979.